Written by Felipe Azenha & filed in Cyclists & Pedestrians, Retail, Taste & Toast, Urbanism. The New Yorker in me loves a good bagel and slice of pizza. I also love some good urbanism. Luckily I have found all three in Midtown. Believe it or not, Brooklyn Bagles and Primo Pizza actually import New York City tap water to make their bagels and pizza. The owners believe that the water makes all the difference in the dough-I have to agree with them. Brooklyn Bagels and Primo Pizza are independently owned and the deli and pizza shop are next-door neighbors. I’m going to go out on a limb and say that Brooklyn Bagels makes the best bagel in Miami and Primo Pizza has the best slice in Miami. The food at these establishments is great, but so is the urbanism where the stores are located. 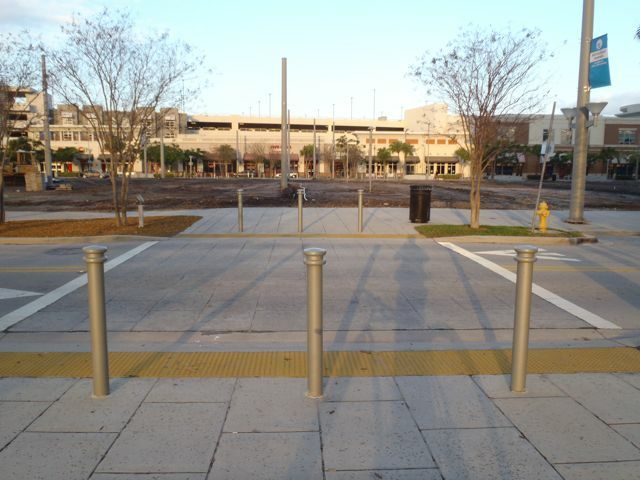 Midtown was developed to be a walkable urban environment; thus far it has achieved what it has set out to do. There is density, the streets are narrow to discourage cars from speeding, and the sidewalks are wide and shaded by trees to encourage walking. 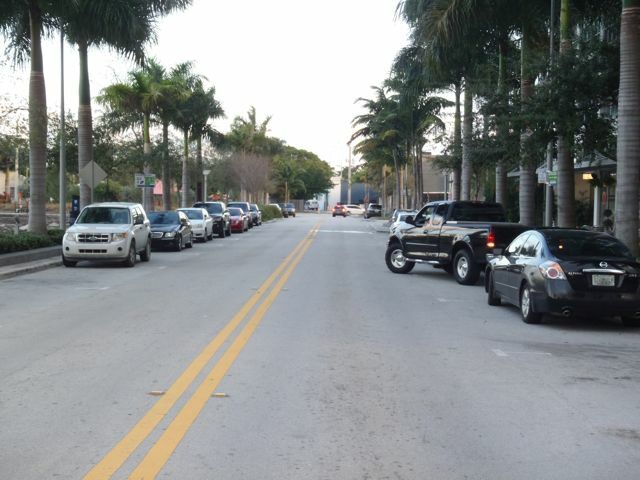 Streets are lined with parallel parking and bollards that act as a protective buffer between cars and pedestrians that makes pedestrians feel safe while walking. Cars were not the main concern when Midtown was designed; pedestrians were the priority. Raised crosswalks calm traffic and discourage speeding. 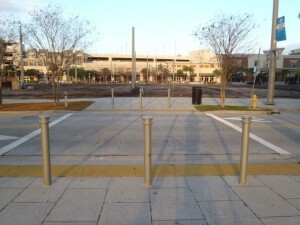 Bollards act as a buffer between cars and pedestrians. Narrow streets and parallel parking discourage speeding, calm traffic, and act as a buffer between the street and sidewalk activity. Parallel parking is also necessary for businesses to survive. 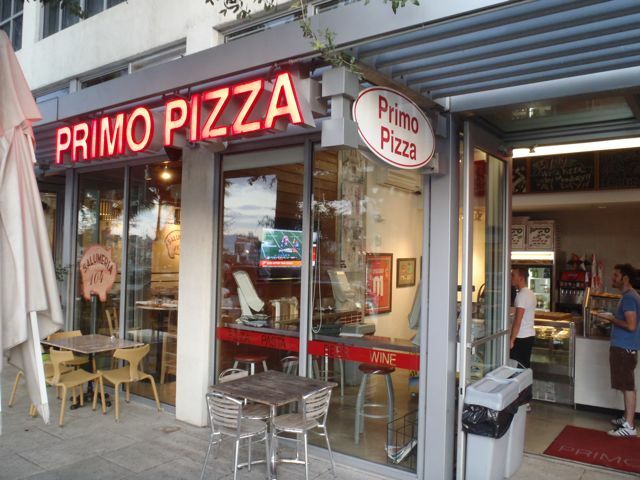 Brooklyn Bagels and Primo Pizza customers need to have accessible parking in order for these establishments to survive. Wide sidewalks easily accommodate outdoor seating and allow for pedestrians to walk comfortably. 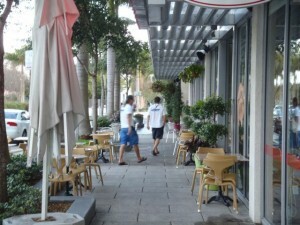 Shade trees provide pedestrians and diners a bit of relief from the sun. 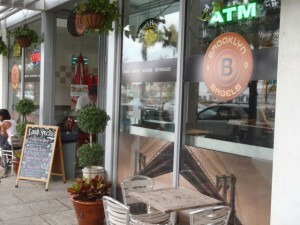 Great urbanism makes for an even better place to enjoy my favorite foods.